Prepare Lumpia Egg Wrappers and have it ready. Heat oil over medium heat. Sauté garlic and onion. Add pork and stir-fry until it changes color, about 5 minutes. Add water, cover and simmer for 8-10 minutes. Season with salt, patis and pepper. Add potato, stir-fry for 5 minutes. Add green beans, singkamas, carrots, cabbage, chick peas and shrimps, stirring for 5-10 minutes or until vegetables are cooked but still crisp (don’t overcooked). Taste and correct the seasonings. Remove from heat and set aside. Let it cool to room temperature. Place a lettuce leaf at the center of a lumpia wrapper, put 2 heaping tablespoon of pork-vegetable mixture along the lettuce leaf. Sprinkle a teaspoonful of peanut over filling. Fold the bottom part of the wrapper over the filling. Wrap one side of wrapper over the filling and roll to the other end to make a neat package/cylinder with top part of lettuce leaf slightly protruding out of open end of roll. Cover finished roll with waxed paper while doing the rest. Cut waxed paper into squares slightly bigger than lumpia rolls and wrap each roll individually in waxed paper to keep from drying. Serve fresh lumpia wrapped. Let the individuals unwrap rolls themselves just before eating them. Serve with Lumpiang Sariwa Brown Sauce and minced garlic place in separate bowls. If singkamas (turnips) is not available in your area, use sayote (chayote) or water chestnuts as a substitute. 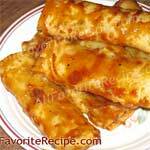 If you’re in the Philippines and have an access of ubod (heart or pith of palm), replace potato, singkamas and carrots with ubod to make Lumpiang Ubod instead. 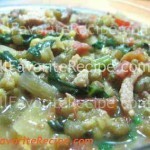 im really looking up for the filipino recipe which can help me to cook foods i want to eat.thanks and more power.